More sunshine and very warm temperatures are ahead for your Tuesday. South winds helped to keep temperatures below average in some areas of the valley yesterday, but are not expected to have the same impact for your Tuesday. We are starting out with winds out of the Northeast to 10mph this morning, but the winds are expected to shift to become out of the South this afternoon. South winds will keep high temperatures somewhat in check, but will arrive much later in the day compared to yesterday. Temperatures are starting out in the mid 60's for the valley this morning, and in the 40's to 50's in the mountains. Your Allergy Report is showing grass, weeds, trees, and mold are all in the low range for today. Humidity will dip to as low as 10 percent this afternoon, and the dry conditions will help to keep fire danger elevated. Temperatures are projected to climb into the mid 90's in the valley later today, and into the mid 80's to low 90's in the mountains. A wet and cool system will be passing through the Pacific Northwest over the next few days, and that will result in a modest cooling trend in Northern California. Temperatures will dip to around average on Wednesday, and will then dip to slightly below average on Thursday. Valley areas will range from the high 80's to mid 90's during that time. 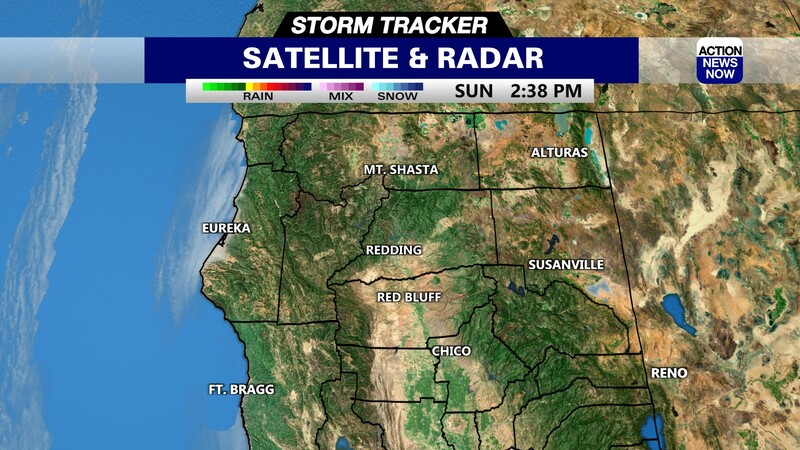 Some clouds will brush through Northern California on Wednesday evening, but we are expecting any chance for showers to stay well to our North. That cool and wet system to our North will pass off to the East late this week, and a big warming trend will return to our neck of the woods. Valley areas will end up back in the high 90's on Friday afternoon, and will then climb back into the triple digits this weekend. 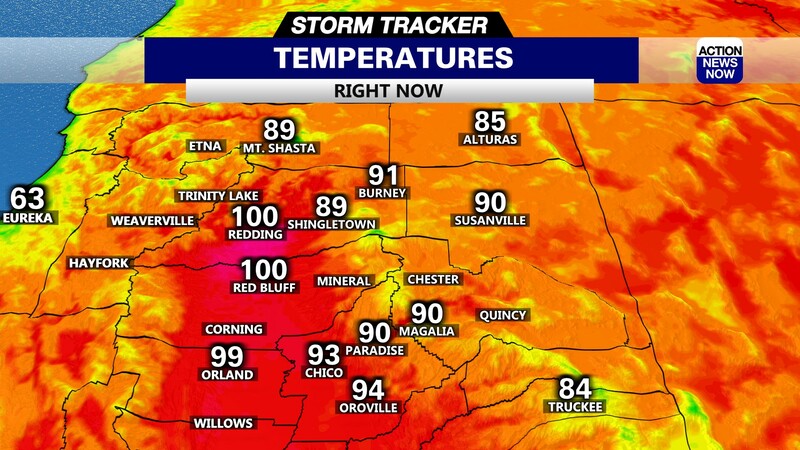 Valley areas are projected to top out in the 100 to 105 degree range through your weekend. Very low humidity, and stronger North winds will combine with the above average temperatures to result in high to extreme fire danger for both Saturday and Sunday. 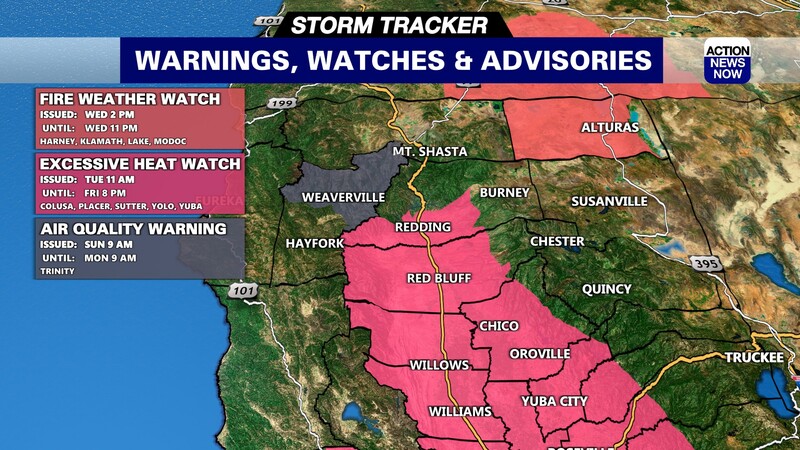 This weekend looks very similar to last weekend, so fire danger will become a major concern moving forward.